This entry was posted in Events and tagged football, hotel on September 11, 2012 by Wire Eagle. AUBURN UNIVERSITY – Auburn University football fans can meet, play with and take photos of real tiger cubs Friday, Sept. 14, at The Hotel at Auburn University. 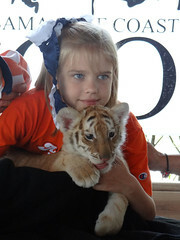 From 3-6 p.m., Auburn supporters can play and pose with Fatima and Ceylon, two 11-week-old tiger cubs from the Alabama Gulf Coast Zoo. 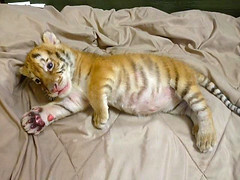 Although there is no cost to see the tigers, guests are asked to give a donation in order to hold the tiny tigers and have pictures taken with them. Photo opportunities will be available on a first-come, first-served basis, so Tiger fans are encouraged to arrive early. All money raised during the event will benefit the Alabama Gulf Coast Zoo. 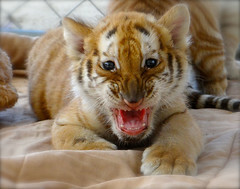 The tiger cub viewing area will be set up in the lobby by the main doors to the hotel. Although the hotel will have a photographer on site to take pictures, attendees may take their own. Photos will be posted online so they can be downloaded and printed. For additional information and to view some of the images, go to the hotel’s Facebook page at www.facebook.com/auhcc. 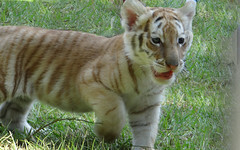 For more information about the Tiger Cub Kick Off event, call (334) 821-8200.